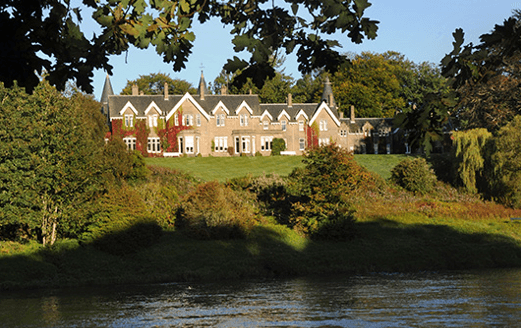 When planning a fishing holiday in Scotland the top priority for many of our clients is to stay in a riverside hotel. Proximity to the salmon fishing or to the brown trout fishing is important to them, not just for convenience, but also because many visitors from Europe or the US are used to driving on the right-hand side of the road and are uncomfortable about driving on the opposite side. This recently refurbished 4-star hotel is situated right on the banks of the beautiful River Dee. The rooms are all individual and characterful and you can dine in the restaurant overlooking the river or in the split-level bar or on the sunny terrace. The best nearby salmon beats include Cairnton, Lower Blackhall and Crathes Castle. 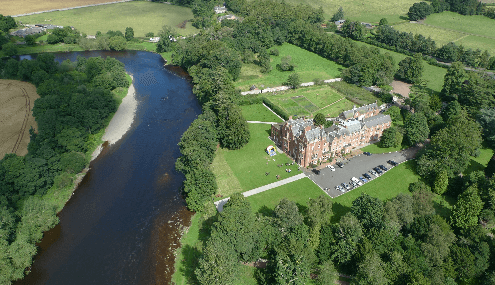 This large, red sandstone hotel occupies a secluded spot on a wide bend in the River Tweed, near the village of St. Boswells. The wonderful ruins of Dryburgh Abbey are nestled in mature woodland, within the hotel grounds. The 3-star hotel offers comfortable rooms and exceptionally good value dining. From the hotel, you can walk to Upper and Lower Dryburgh salmon beats. There is no better example of Scots baronial architecture than this fine building overlooking the River Tay. Conveniently located near Perth, the hotel is accessed via a long driveway lined with rhododendron bushes and Scots pines. This is a true, 4-star fishing hotel offering the quintessential Scottish experience. Nearby salmon beats include Cargill and Ballathie. If you’re looking for seclusion and luxury, then this is the place for you. 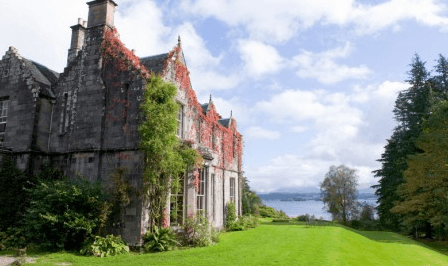 This stunning and totally unique 4-star hotel overlooks Loch Awe and the ruins of Kilchurn Castle. As well as being an incredibly romantic place, the hotel is on the shore of the best pike fishing loch in Scotland. The Harry Loch on the Orkney Isles is a very special place for wild brown trout fishing in Scotland. And, for very many decades the Merkister Hotel has been the hotel to accommodate fishers from around the world. For the ultimate traditional loch fishing experience there is no better place to stay – great meals, comfy rooms, superb bar and a short walk to the shore of the loch. At River & Green we can provide all standards of accommodation from cosy B&B’s to lavish 5-star hotels and exclusive use castles. We also provide access to all forms of fishing in Scotland, professional guides, equipment and transport (excluding flights).